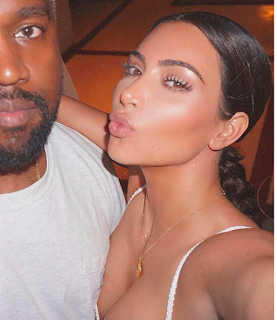 Kim, the eldest of the Kardashian clan and also a mother to two beautiful kids recently shared a rare but sweet selfie of herself with husband Kanye West via her IG page this morning. Kanye, who hardly smiles or laughs in public, managed to put up a smile for the photo that sees his pouting wife looking all radiant. It is indeed on record that Kanye hasn't smiled so radiantly for a very long time now and from what we can deduce from this smile, something great is about to happen and we can't wait to celebrate with them.